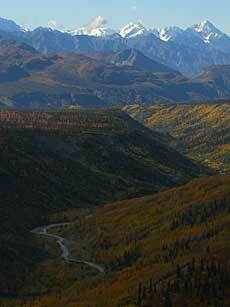 Meekin's Air Service provides visitors to Alaska a unique opportunity to view the majestic wonder of Alaska's Chugach and Talkeetna Mountains. On our one hour flightseeing trip you'll see the mighty Matanuska Glacier, a favorite spot for mountaineers and ice climbers as well. 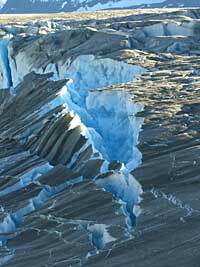 We'll also have spectacular views of wild rivers fed by melting ice and snow. Perhaps we'll see rafters or kayakers fighting the swift currents. There's always the chance of seeing dall sheep, moose, bear and caribou in these remote locations throughout the Chugach Mountains. Talkeetna, an Indian word meaning "where the rivers join," and when you fly over this beautiful country it will be easy to understand how it got it's name. 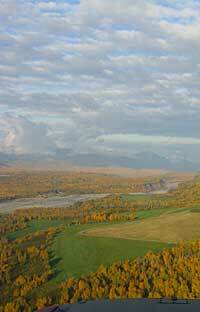 In July this region is home to herds of caribou 20,000 to 30,000 strong. It's quite a sight to see but also keep a sharp eye for sheep, moose and bear.